A backlog grooming meeting, or a “grooming scrum” is a scrum ceremony and part of the agile meeting process. Backlog grooming meetings are typically held toward the end of a sprint. The goal of the meeting is to keep your backlog (the complete list of projects that remain to be done) up-to-date and ready to be pulled from for upcoming sprints. 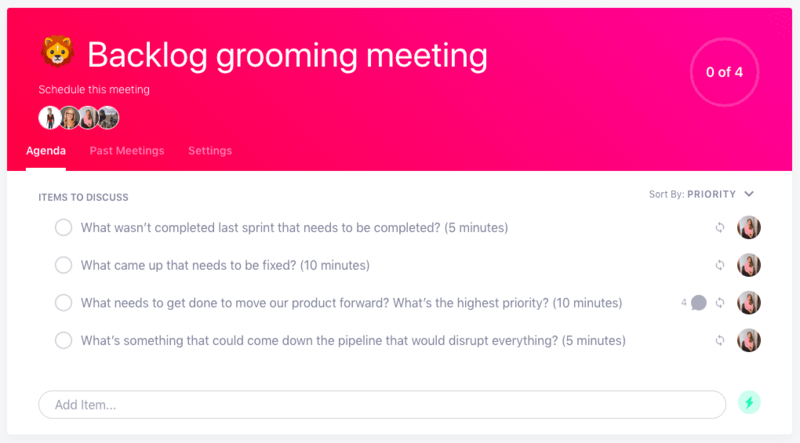 Click here to jump to the SoapBox backlog grooming meeting agenda template! Hopefully this list is small – and you should already be well-informed coming into this meeting as to what wasn’t done and why. During this discussion, determine whether or not the estimates were accurate for the project, and if the uncompleted work can move into the next sprint. As you’re continuously building and refining a product, you’ll inevitably run into bugs or larger problems with your journey. Determine the scope of work and prioritize those projects in this meeting. Beyond fixes and work carrying over from past sprints (and hopefully these don’t monopolize the work for the upcoming sprint – though at times they will), go through the backlog of projects that will move your product forward. Often times this means new features, new functionalities, etc. Reserve a few minutes at the end of your grooming scrum to ask your team if there’s anything that will inhibit tackling high-priority projects and tasks off your backlog. Keep your project management tool (we use Jira) open while you’re running this meeting. Use it to look at new bugs, issues and technical debt to help facilitate the meeting. If a project doesn’t have story points attached to it but is in the backlog, then it shouldn’t be at the top of the list. The idea here is that if something takes high priority, it should have story points attached to it in order to move forward. Like any meeting, make sure you take notes and assign action items as they come up in your meeting. That way, anyone can revisit what was discussed and the context of the backlog. Keeping your backlog up-to-date is important for any product and development team. It ensures you’re tackling the right things and allocating the right amounts of time for your team.